O.K...prior to reading Kate's post over at Chic on a Shoestring I had no idea what a scraper was or did. So I did a little of my own poking around and what I found out shook me to the core of my being. 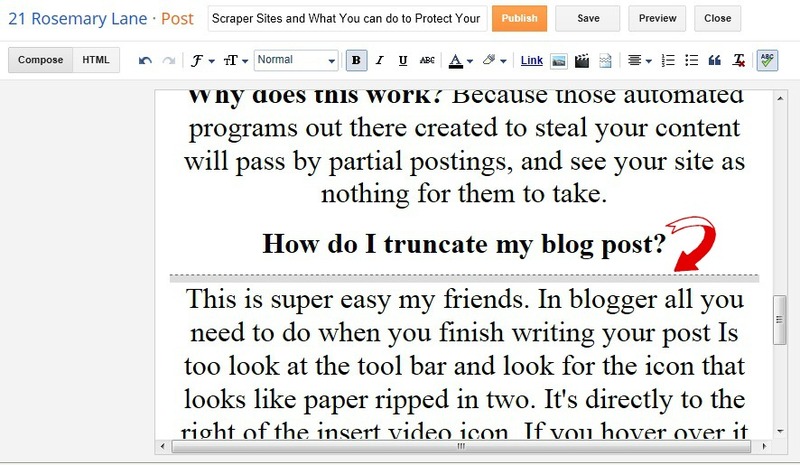 Scraper sites are nothing more than spam websites created largely by using stolen content, images and so on from blogs written by tons of talented people with absolutely no regard to copy write infringement, all for their own monetary gain. They are created for the most part to capitalize on Google Adsense and other like programs which work on a pay per click payment program. They steal...yes that is right they steal, popular content which is then posted to their site. This is how Bruce Clay of Bruce Clay Inc. Global Internet Marketing Solutions describes the activity of these scraper sites. "Generally, scraper sites are created specifically to put paid ads on sites such as Google AdSense. Many times the ads on the page are the only relevant item on the page for the user, as the links to all of the other sites are not what the user was searching for. Thus, the user clicks on the Google AdSense text link or affiliate link and the scraper yields a monetary return. 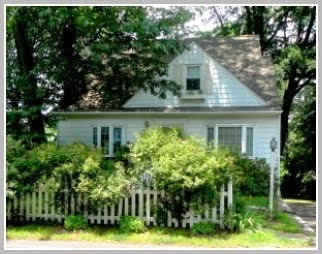 Scrapers create these sites based on listings with high-traffic snippets that contain keywords with high activity. These listings bring traffic to the scraper site, which in turn redirects the user to the site that the scraper has put together. The content that is stolen usually has a high activity count and is not necessarily relevant to the ad, but since the activity is high, the scraper site brings in the traffic." It sickens me to think of all the time it takes you or me to come up with a concept for a project; spend the money on materials; spend the time working on the project; taking and editing photos; writing the blog post; editing and proofreading and editing the post again; and then finally hitting the publish button just for some automated program to come along and abscond with that beautiful post. AND supposedly these scraper sites are on the rise. 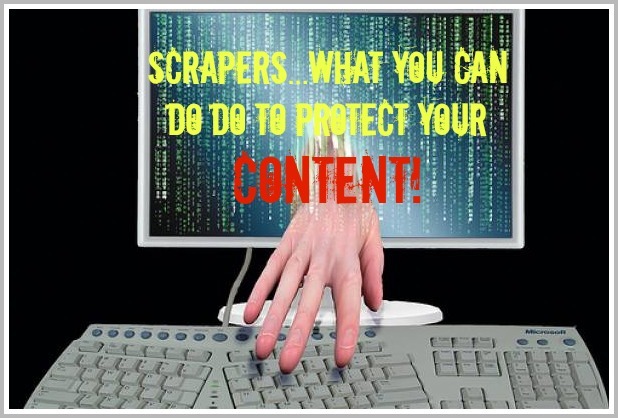 So what can be done to help protect your content? Well one way is to do what Kate suggests, and that is to truncate your posts. This means that the home page of your blog will only show an excerpt of each post, not the entire body of work. I know I hate having to click around to read content too, but in all reality what is just one more click here or there in the scheme of things, especially if you know that it is protecting some one's work from being stolen. Why does this work? Because those automated programs out there created to steal your content will pass by partial postings, and see your site as nothing for them to take. 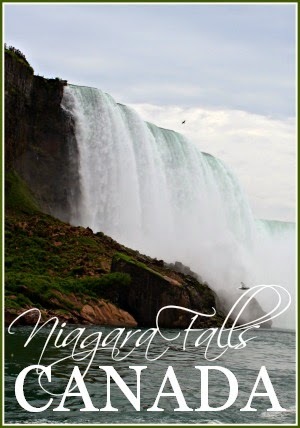 How do I truncate my blog post? This is super easy my friends. 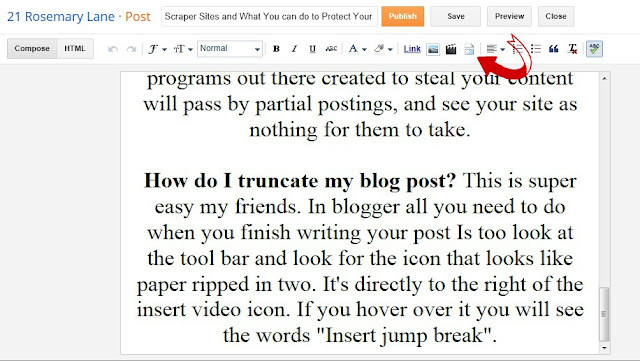 In Blogger all you need to do when you finish writing your post is to go to the tool bar and look for the icon that looks like paper ripped in two. It's directly to the right of the insert video icon. If you hover over it you will see the words "Insert jump break". 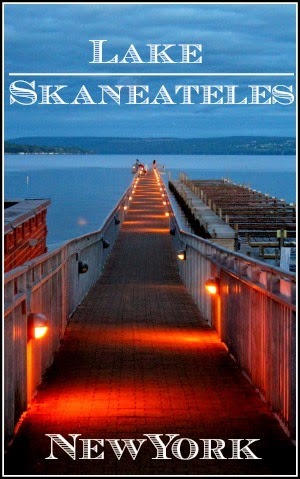 Place your cursor and click where you would like to truncate your post. A dotted line will appear below the cursor. 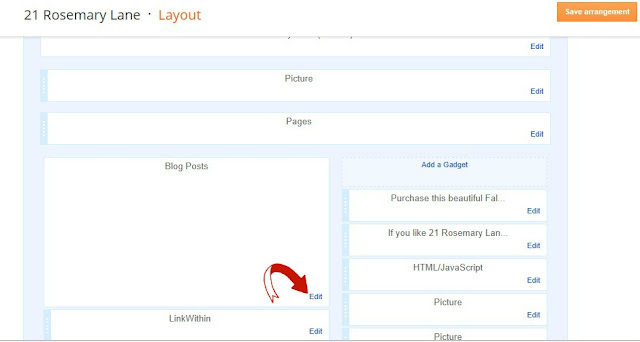 You will not be able to see the break if you preview your post, it will only appear on the home page of your blog. If you want to change the wording or make the verbiage all caps, just go to "Layout" and click on the word edit which appears in the blog post box. When the "Configure Blog Post" box appears you can go to the line that says "Post Page Link Text" click and change the wording. What else can be done to stop content scrapers? Well if you are not doing it already, please make sure you watermark all of your photos, this may deter some scraper sites from using your content. 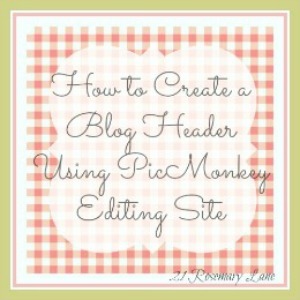 You can also use your blog name in the title of your blog post, again to deter the thievery of your content. 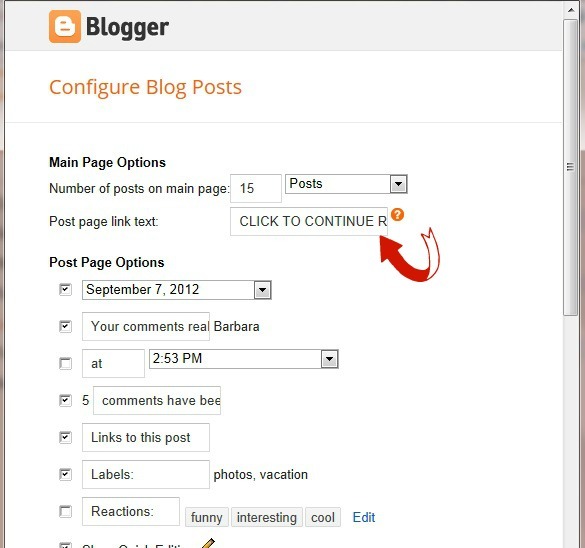 Another good idea is to include back links in your post to other content from your blog. 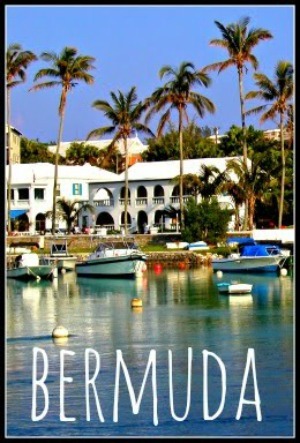 This is what helped the wonderful blog Between Naps on the Porch find out that her content was being stolen. Almost all of her content for the first 2-3 years of her blogging was stolen by one of these scraper websites. BNOTP has a very informative post that goes into great depth and provides oodles of incredibly useful information on how to detect and report any activity of this sick practice. There is also specific information regarding helpful plugins for those of you using the WordPress platform. To read her post about this horrific experience click here. My sincere hope is that this post to some extent has helped spread the word about the terrible practice of scraper sites. 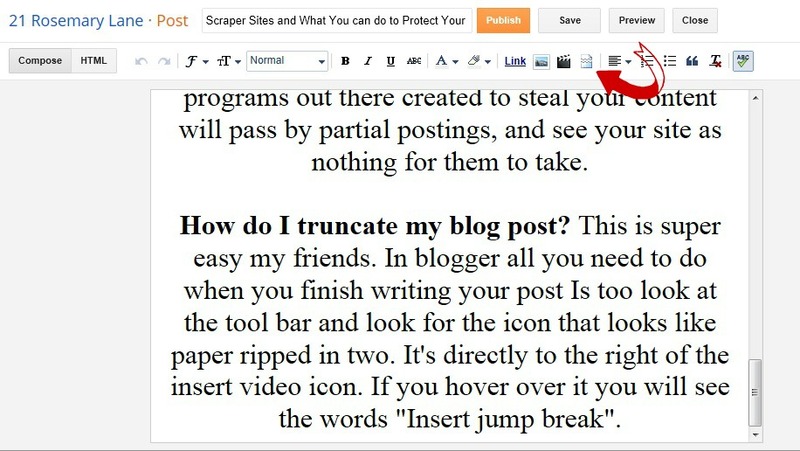 I am also hoping that this has possibly given you a tool or two to help protect your most precious blog content. My love to you all!!! Such a shame! thanks for sharing. I have heard of this before but thank God I don't really need to worry about this because I am adamant about NO advertising on my blog and I don't take blogging seriously enough to worry about copyrights!! LOL! Thanks Barbara! There is so much to learn as a blogging. Thanks for all of the great information on truncating today, Barbara. It was truly so helpful. This is one reason why I don't advertise on my blog, too. 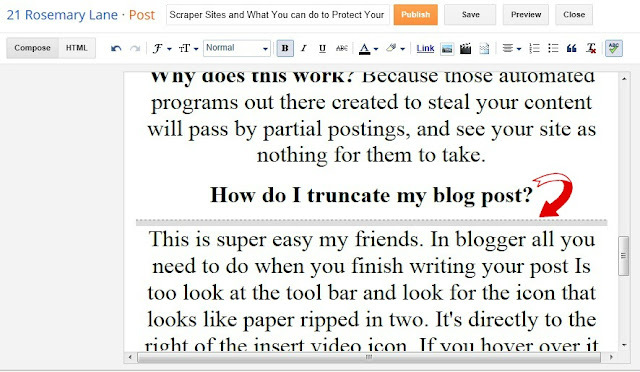 The scrapers don't steal content as it appears published on a blog, they steal it via the automatic RSS feed. It's not necessary to truncate one's posts. Set the RSS Feed to Short or None and there's nothing for scrapers to steal. Thanks a lot for sharing this with all of us you really know what you're talking about! 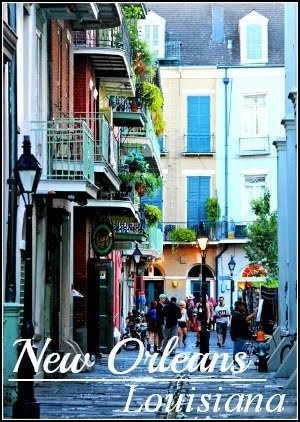 Bookmarked :) Please also visit my site about how to make money.